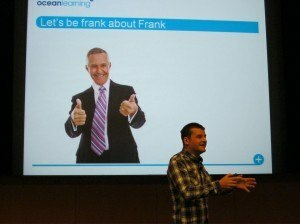 Paul Kenny developed the story, reminding us that Frank was just taking advantage of our belief in this myth, especially amongst technical people who doubt their own abilities. The irony is of course that we have the best knowledge, and also the passion and enthusiam to sell the product. There is definitely still a place for the brilliant salesperson and you can have a job from me anytime 😉 But the conference reminded me very strongly that sales (and marketing) are an integral part of any technical persons job. And I have Frank’s picture on my desk, just to keep reminding me of that.